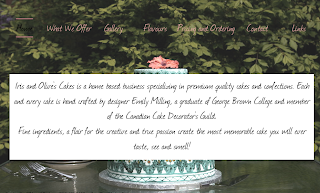 Iris and Olive's Cakes: Blog: New Website! OK! So after lots of labouring and figuring and whatnot, I have a new website! No more blogger website, alas, but this new one is pretty darn fancy! Click here to see it! The address will be changed later to www.iris-and-oilves.com for future reference. The website can also be accessed through the "website" section of this blog, by clicking the picture of the Moroccan Themed Wedding cake. Of course I'll still blog here, because hey, blogging is the bomb diggety. Yes, bomb... diggety.